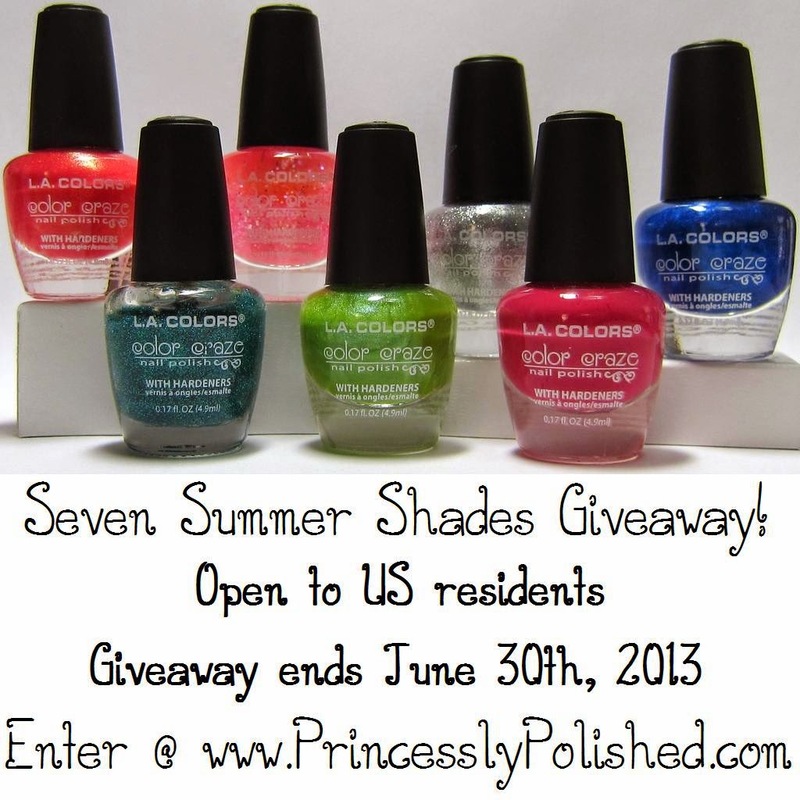 Princessly Polished: Seven Summer Shades Giveaway! Win Mini Polishes! Hello everyone! It's giveaway time again! While going through my polish collection I realized that I had some brand new doubles of nail colors from L.A. Colors, and I'd like to share the wealth! This colorful bunch will be perfect for warm-weather manicures, vacation take-alongs, and nail art. As always this is open to new and old followers of my blog and Instagram account, but with the close of some Google blog services (see here) you might have to update the way you follow Princessly Polished in order to enter! I highly recommend Bloglovin', which you can use via a smartphone app or Online, and I've made that option earn extra entries! Enter using the Rafflecopter widget below! 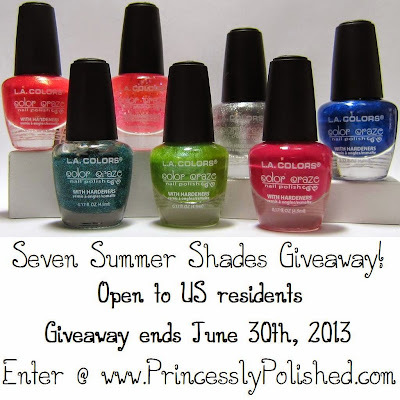 One winner will receive a set of 7 mini nail polishes by L.A. Colors. This giveaway is open to all followers living in the US (and US territories)! International followers may enter if they have a US mailing address to send the prize to! Please note: With the close of GFC on the horizon, GFC is not an accepted way to follow PrincesslyPolished! It won't be available by the time I'm selecting a winner! Thanks for the opportunity! I'd love to win because a lot of those colors aren't like anything I already have and I think they're beautiful!